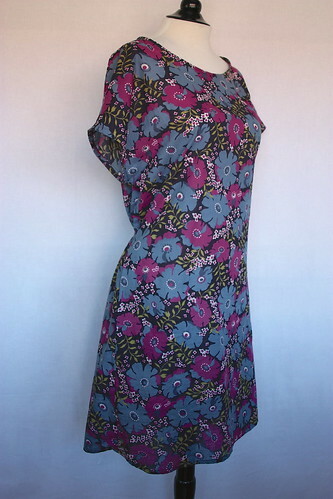 “Oh happy day” when we received The Staple Dress by April Rhodes in the shop. I’ve been dreaming of fabrics to use for The Staple Dress for quite a while. In fact I have a stack of fabric that is my potential Staple Dress stash. My brother is getting married in September so I need a great dress. 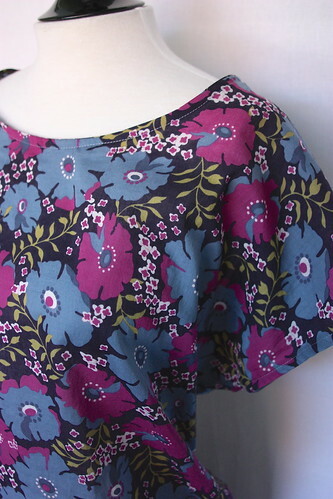 The American Folk Generation Cotton Lawn in Purple called out to me. 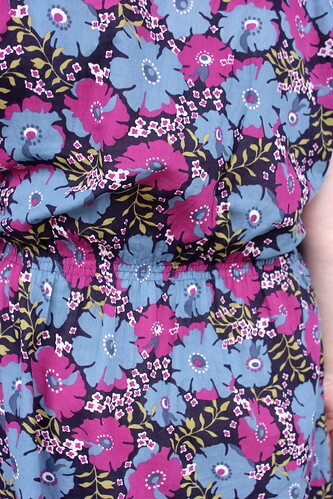 Rachel from Imagine Gnats made a beautiful Staple Dress using a Nani Iro print. When I saw her dress I knew I had to try her version. Three rows of shirring were put in the back at the waist. 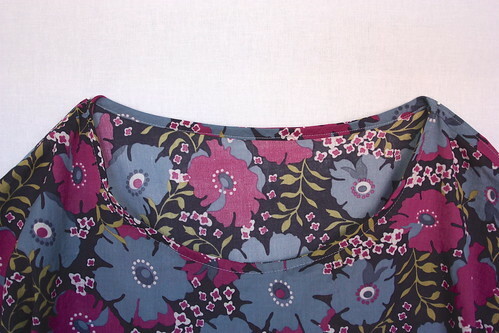 By shirring only the back, the dress ends up with a more fitted front. The loose fabric is drawn to the back giving the front of the dress a flatter, shapelier line. The pattern instructions gives great guidlines for placing the shirring in just the right spot to suit your body shape and style. The instructions recommend using the bust measurement for sizing. The hips and waist have enough ease for most people. There are helpful tips included for deciding between sizes as well. I used a regular sewing machine in making the dress. There is really no need for a serger unless you wish to finish the seams in that way. The facing detail made it super easy to finish the neck and armholes. Don’t be afraid of the smocking. It’s super easy and fun! The elastic thread is wound onto the bobbin by hand. I found I did not need to change my machines tension, just increase the stitch length to 3. When I finished the dress and brought it into Pink Chalk, 3 chalkettes tried it on. We all have different body shapes but somehow this dress flattered everyone of us. It was like the Sisterhood Of The Traveling Pants. How is that possible? Needless to say the whole shop is a buzz with talk of fabric selection for each Staple Dress we’re dreaming of. Commercial size range of all those the dress fit please. I am considering for my daughter. Sweet dress ~ and the cardigan is perfect with it ~ you look so cute! Yay a dress with sleeves!! That dress is amazing. It looks like it would hide a multitude of sins (and, in my own case, the aftermath of two pregnancies and no willpower :-)) and still be really stylish. And I love the way you model it. Real people wearing stuff they made themselves and a smile is so much nicer than the airbrushed pics we are bombarded with day after day! This dress is beautiful! Do you think if I lengthened it it would still look smashing? I like my dresses much longer. Fabulous dress! I’ve seen it on so many blogs, but this is the first time I’ve felt convinced!! Did you have to underline the lawn for the sheerness of the fabric or so that the fabric would have enough body to attach the elastic thread for the shirring? The dress, and modal, are beautiful! So, the waist stirring is chosen after the dress is completed? Would an empire waist work with this dress? Would such a high waist/under bust placement leave enough fullness in the bust and arm easement? Do you think a rayon print would work, something heavier than a lawn? Hi Karen, Yes the placement of the shirring is chosen after the dress is complete. An Empire waist would work. Once the dress is complete use a thin belt or soft tape measure to find just the right placement for your body style. Violet Craft Waterfront Park Flight Iris is very special for a dress. I love this dress and have made two now after seeing yours. I could do with a bit of a pointer though if that’s okay? I found my sleeves to be a bit too tight to be comfy. If I make the bigger size then I end up looking too puffy on the top front and back. Any suggestions? ?